For other uses, see Kapunda. Kapunda is a town on the Light River and near the Barossa Valley in South Australia. It was established after a discovery in 1842 of significant copper deposits. The southern entrance to the town has been dominated since 1988 by the 8-metre-tall statue of Map Kernow ("the son of Cornwall"), a traditional Cornish miner. The statue was destroyed by a fire on the morning of 1 June 2006  but has since been rebuilt by its creator, Ben van Zetten. Francis Dutton and Charles Bagot, who both ran sheep in the area, discovered copper ore outcrops in 1842. They purchased 80 acres (32 ha) around the outcrop, beginning mining early in 1844 after good assay results. Mining began with the removal of surface ore and had progressed to underground mining by the end of the year. Copper was mined until 1879. There are also quarries near the town which provide fine marble ranging from dark blue to white. Marble from the Kapunda quarries was used to face Parliament House in Adelaide, and the pedestal of the statue of Venus on North Terrace, Adelaide is made of Sicilian and Kapunda marble. Ore was initially exported to Swansea, Wales, but later Welsh smelters migrated to South Australia and the ore was smelted locally by 1851. Typically, the miners were Cornish, labourers were Irish and smelter specialists were Welsh. Trade and agriculture were Scottish and English. German farmers and timber cutters at nearby Bethel had already been in the area. Underground mining became more difficult as the mines reached deeper. A steam engine to drive a water pump was installed in 1847, replaced by a larger one in 1851. In 1865, the mine was leased to a Scottish company which switched to open cut mining methods and replaced the smelters with a different treatment method (cooking the ore with salt to produce copper chloride). Copper prices fell in 1877 and the mine closed in 1879. Mining operations ground to a halt in 1851 with the impact of the Victorian gold rush, restarted in 1855. A railway from Adelaide was opened in 1860, and extended to Eudunda and Morgan in 1878. Kapunda had a strong Catholic community and Saint Mary MacKillop visited and established a convent there. St John's Reformatory for Girls operated from 1897 to 1909. Kapunda is famous as the home of Sir Sidney Kidman. He was a major cattle pastoralist who at one time owned 68 properties with a total area larger than the British Isles. He held annual horse sales at Kapunda with up to 3,000 horses sold during the week. His house, Eringa, was donated to the Education Department, and is still used as the administration building for Kapunda High School. The town also has the unfortunate honour of being titled the most haunted town in Australia after a television documentary focused on the town. Most locals were not amused, however it has led to an increase in the number of tourists that visit the area. Owing to this, the ruins of the Reformatory, located outside the town, were bulldozed, although some locals still believe in the ghost stories popular in town. The town is also close to the historical Anlaby Station and the manor, houses, gardens and other buildings on the property, many of which are being restored by its current owners. Kapunda was home to several notable manufacturers of farm and mining machinery: Robert Cameron, Joseph Mellors, James Rowe and Adamson Brothers. It was with this last-named company that T. J. Richards, the founder of one of Australia's largest coach-building firms, started his career. Today, Kapunda is a producer of cereal crops, mainly wheat, barley and oats. Value-added services carried out by local industry include stock feed milling and hay processing. Kapunda is a contributor to the wine-growing industry centred in the nearby Barossa Valley. Kapunda has hosted the Kapunda Celtic Music Festival since 1976. Kapunda was home to several newspapers. The Kapunda Herald (known as the Northern Star from 1860 to 1863 and the Kapunda Herald and Northern Intelligencer from 1864 to 1878) was printed in the town until 1951, when it was merged with the Barossa News to become the Barossa and Light Herald. Another publication, the Farmers' Weekly Messenger (4 April 1874 – 27 September 1878) was also printed in Kapunda by Ebenezer Ward. Within a month, in May 1874, it absorbed another Ward newspaper, Northern Guardian (1 April – 6 May 1874), which itself was a continuation of the Guardian and Northern and North-eastern Advertiser (19 May 1871 – 28 March 1874) and the short-lived Gumeracha Guardian and North-eastern Advertiser (19 March 1870 – 20 October 1870). 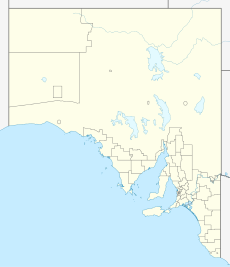 Kapunda is in the state electoral district of Stuart, the federal Division of Wakefield, and the centre of the Light Regional Council. Vivian Bullwinkel (1915–2000), Australian Army nurse, P.O.W. ^ "Map the Miner destroyed in fire". Australian Broadcasting Corporation. 1 June 2006. Archived from the original on 2 March 2008. Retrieved 6 June 2006. ^ Venus, Statues of the City of Adelaide, Adelaide City Council. ^ "Kapunda". Flinders Ranges Research. Retrieved 21 June 2017. ^ "Kapunda". Australian Heritage. Retrieved 21 June 2017. ^ Atkinson, Amanda (29 March 2015). "Kapunda Mine Trail". Weekend Notes. Retrieved 22 June 2017. ^ "Kapunda". Cadia Valley Heritage. Newcrest Mining. Retrieved 22 June 2017. ^ C. de Leiuen, Remembering the significant: St John's Kapunda, South Australia, Journal of the Australian Catholic Historical Society 36 (2015), 43-60. ^ "Agricultural Implement & General Machine Manufactories. Kapunda". South Australian Register. Adelaide. 18 July 1868. p. 4. Retrieved 17 December 2012 – via National Library of Australia. ^ The farmers' weekly messenger [newspaper: microform]. Kapunda, S. Aust: Ebenezer Ward. 1874. Drew, G.J. ; Jones, J. (1988). Discovering historic Kapunda, South Australia. Adelaide: Department of Mines and Energy, Kapunda tourism committee. ISBN 0-7243-4277-X.